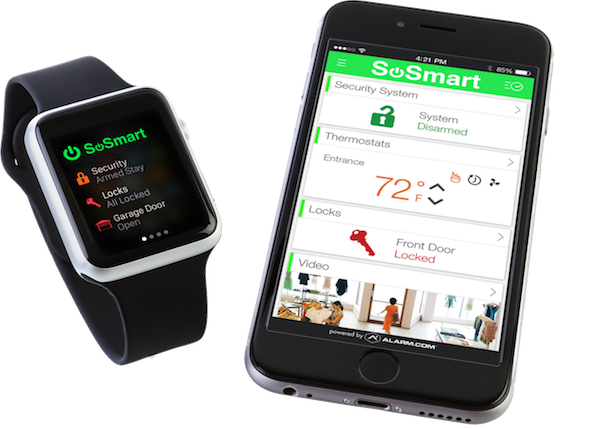 SoSmart offers its customers the latest technology in home security and smart home technology. It’s important that customers are able to control their home through multiple methods. The goal of a smart home security system is to make your home smarter, more secure and efficient. Having the ability to control the system through multiple avenues helps accomplish all of those things! Whether you are using a smart phone or android, we have an app for you! The app is free to download and offers a variety of features including location based services. If you get a mile away from your home and you forgot to lock your door, arm your system or close your garage door, your app will remind you. The app on the apple watch is a sophisticated way to control your home. You’ll feel like James Bond when you are controlling your home from your wrist. Any device that has internet services will allow you to access your system. Simply go to SoSmartSecurity.com and login to your account. From there you’ll be able to add users, change codes, view history, arm the system, lock the doors and much more. With Amazon Echo, you can talk and your home will listen. Tell your home that you want the temperature turned down, the door locked or the security system armed and the SoSmart system will take care of it for you. SoSmart sets the bar high for its customers. All of our customers have a touchscreen keypad which allows you to control your smart home security system at ease. The SoSmart admin team are experts in the home security and smart home industry. Want to make your home almost as smart as you are? Want it to be installed by a knowledgeable licensed professionals? A SoSmart pro can help you.